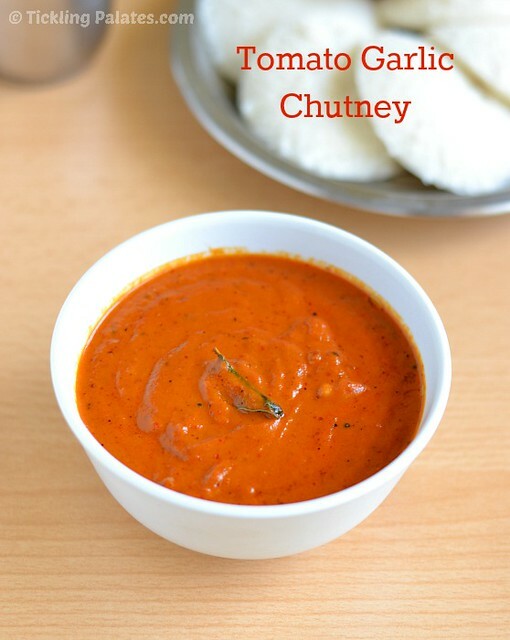 Easy Garlic Tomato Chutney Recipe – A simple, spicy and quick chutney recipe that is packed with flavors and goes well as a side dish with idli and dosas. This red chutney is apt to pack for office or school as it stays good all day long and does not spoil easily and its also suitable to pack while travelling long distances. This is an Andhra style of tomato kara chutney which my Mom learned from her neighbor when she stayed there. The garlic is added raw for making this kara chutney along with other ingredients which makes it even more flavorful and a definite treat if you are a garlic lover. Though I love the flavor of garlic, I simply can’t stand in chutney form, so whenever I make this chutney I sauté the garlic pods a little to get rid of the raw smell. My younger son also does not like the smell that it leaves in your mouth after eating garlic, so sautéing takes care of that problem. If you are game enough, you can use it as a spread on bread too and top it with veggies and cheese and enjoy it as a sandwich. Using Standard tomatoes instead of hybrid tomatoes will give the chutney very good taste and adjust the whole dry red chilies according to your spice level. If you love the flavor of gingelly oil, use that to temper the chutney instead of regular cooking oil. 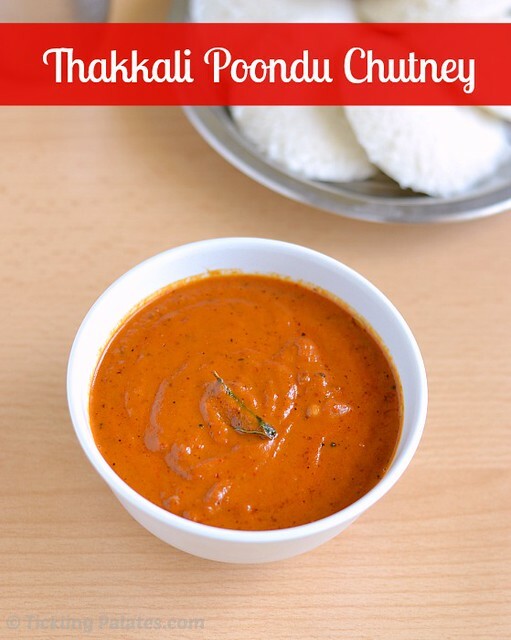 Check out other chutney recipes like pachcha thakkali chutney, ginger tomato chutney, pirandai thogayal, inji chutney to serve as side dish with idli or dosa. 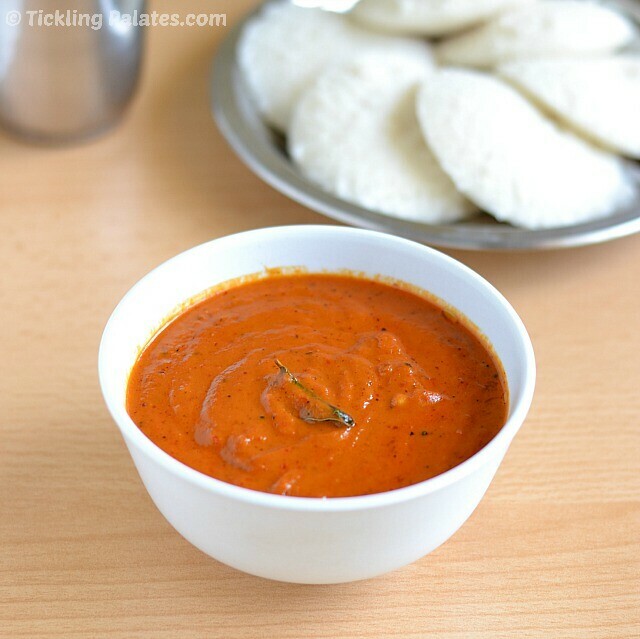 Easy and spicy Garlic Tomato chutney to serve as side dish with idli or dosas. Chop the tomatoes finely. Peel the garlic and keep it ready. Heat a pan with oil. Add whole dry red chilies and sauté for 10 seconds. Add garlic pods and sauté over low flame till it changes color slightly. Take off stove and let it cool completely. Transfer this to a mixie jar. Add the chopped tomatoes, salt and grind to a smooth paste using little water. Heat the same pan with oil. Add mustard seeds and when they splutter, add urad dal and curry leaves and roast for 10 seconds. Add the ground chutney, mix well and let it cook for 1/2 to 1 min. Transfer to a serving bowl and serve hot with spongy idlis. Oh god What a colourful chutney! 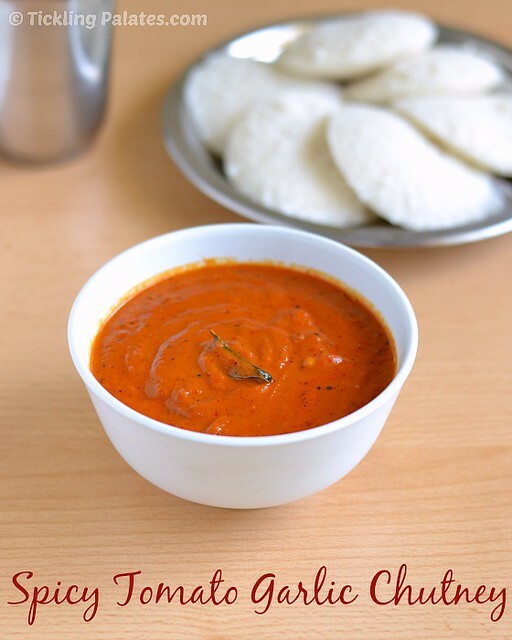 Easy to make side dish for idli dosa. Feel like having some crispy dosas with this vibrant and aromatic chutney.. Thank you very much for your lovely feedback. But while grinding the Tomatoes with the garlic, we won’t get a raw smell of tomatoes. Hi Divya, No you will not as you are already cooking them prior to grinding.